And so it was that the forces of Orkish orthodoxy—an odd concept if ever we’ve heard one—arrived at the Island or Doctor Morork, intent on stamping out both the Grot Rebellion and the Doctor’s unnatural experiments. 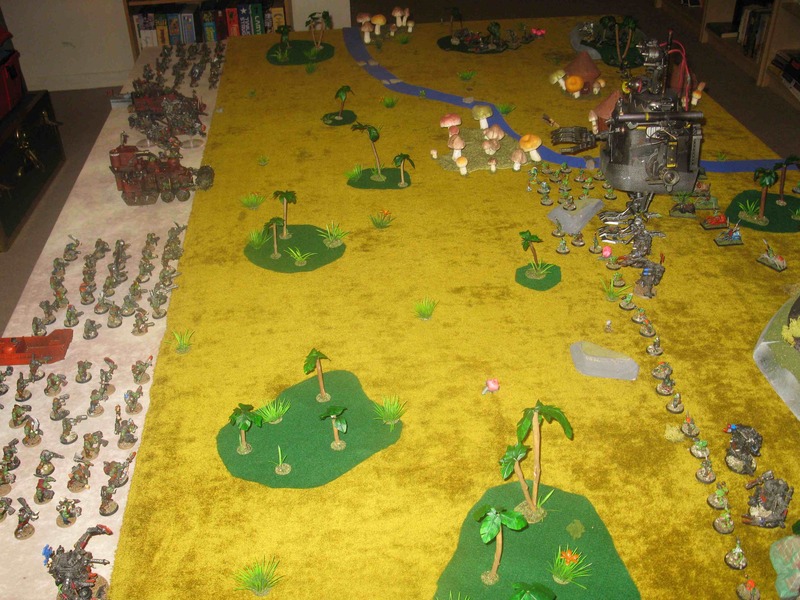 Led by Warboss Vince, they included a unit of ‘Ard Boyz (in a Battlewagon), MegaNobz (+Trukk), three Mobz of Boyz (two with Shootas, one with Sluggas), Tankbustas, Stormboyz (+Zagstruk), Kommandos (+Snikrot), Deffkoptas, and a single Deff Dread (2,500 points). 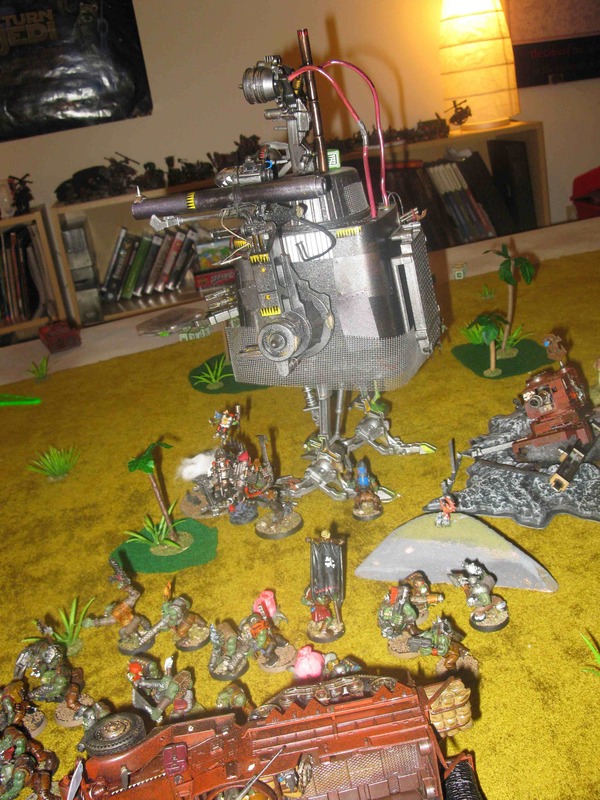 Defending the secret island laboratory were Dr. Morork, Mad Dok Grotsnik, a Big Mek with Shokk Attack Gun, a second Big Mek with a KFF located inside a very formidable Stompa, a unit of Nobz, a couple of units of Grot rebels, three Killa Kans, and unit of Big Gunz. 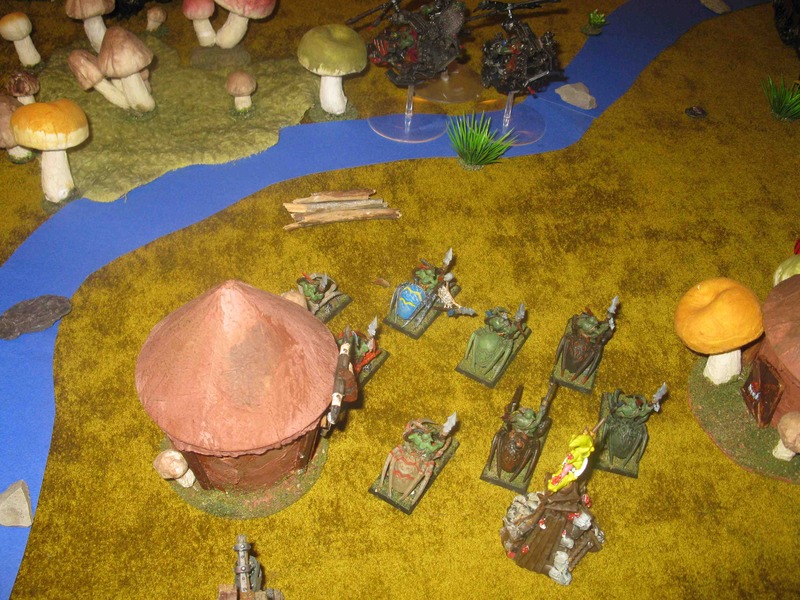 The local tribes assisted too, contributing a Tribal Idol, a unit of Feral Grot infantry, two units of Spider-Riders, and a Feral Lobba. The expected unit of Grot Surfers failed to show up, since they were apparently… well, surfing. Deep inside his volcanic headquarters, Doctor Morork prepared to use his fearsome collection of secret (and rather random) weapons. 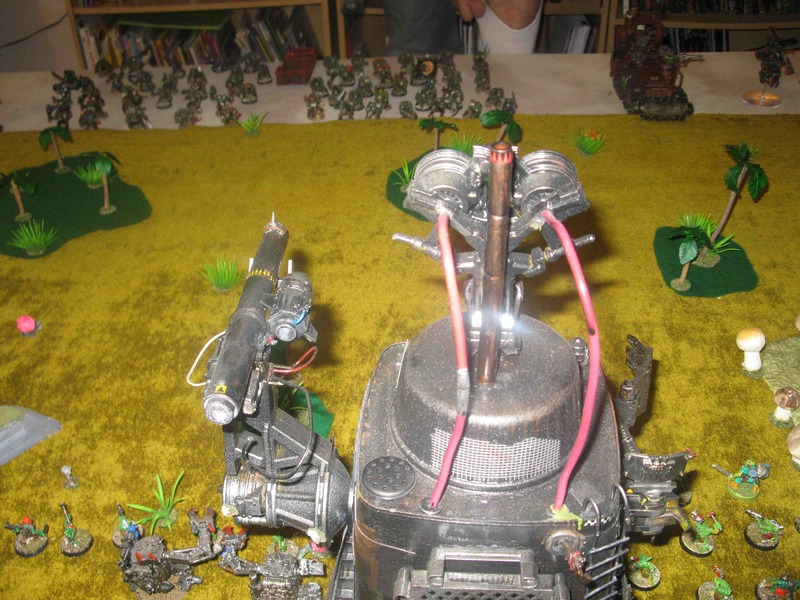 Throughout the battle the Orks would find themselves beset by the automated Zzzap Gunz, boobytraps, and even Nuklear Misslez hidden on the island. The Stompa and its crew sensed there was zogging to be had. 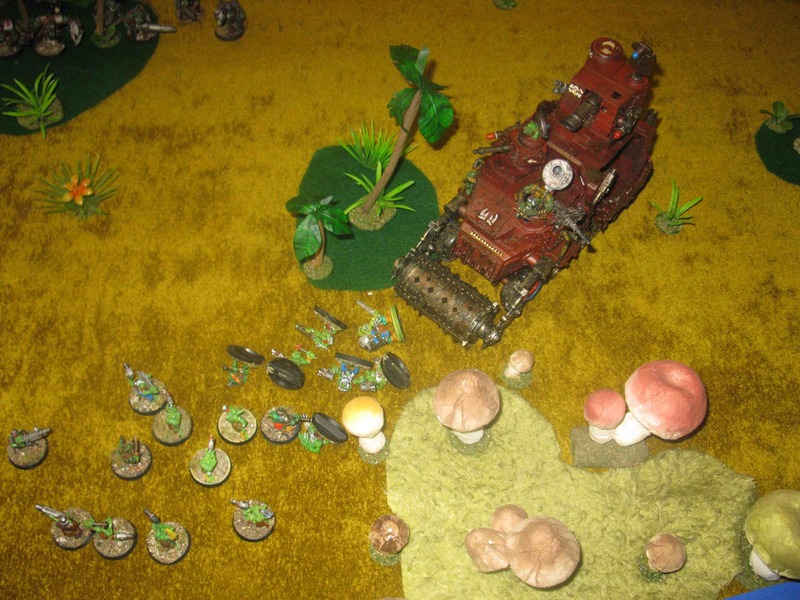 Between Stompa, Lobba, and SAG fire, initial Ork casualties were high, especially among the Tankbustas. Deffkoptas descended on the feral grot village, hoping to destroy their precious Idol. However, the (spider) cavalry arrived in the nick of time, to push them out. …which was soon turned into a twisted pile of rather less pesky scrap metal. 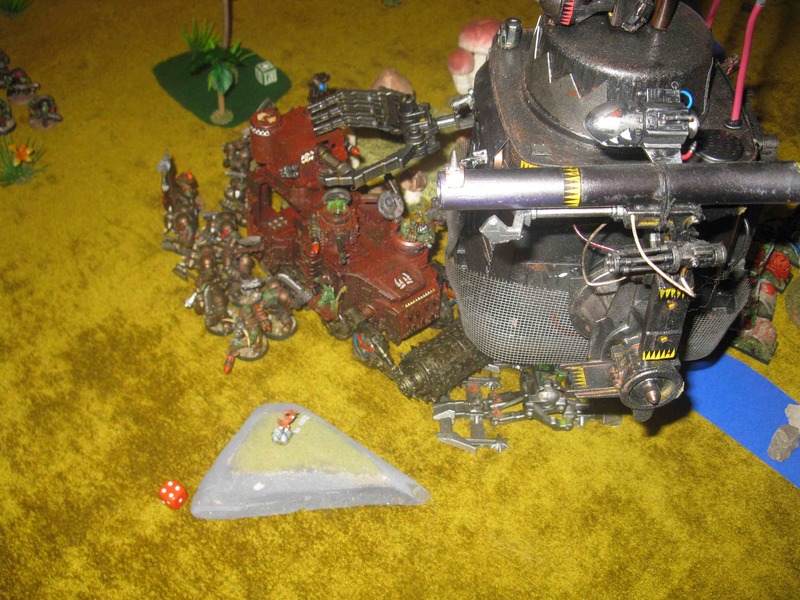 In a fury, waves of Orks would throw themselves at the Mek monstrosity. 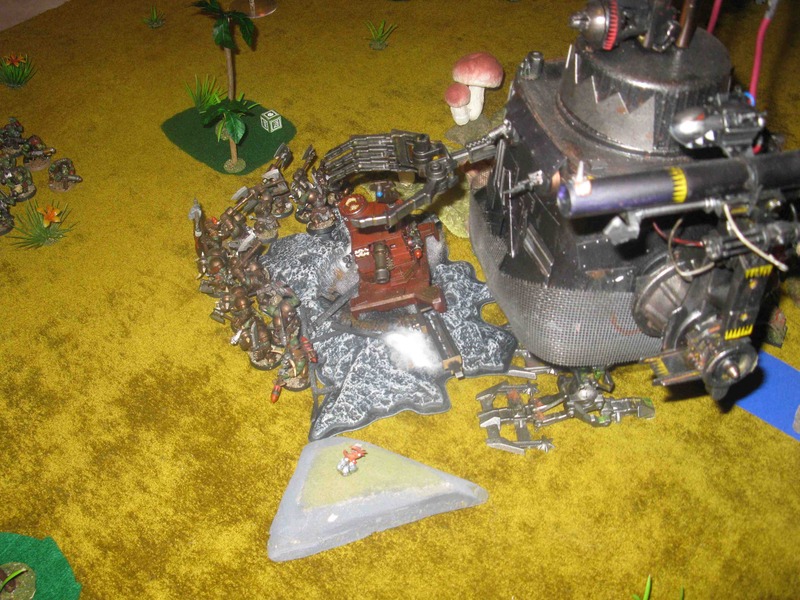 While taking some damage, the Stompa stomped them, and the ground beneath its feet rapidly assumed the colour and consistency of day-old guacamole. In the background, the volcanic lair can be seen (complete with removable top!) 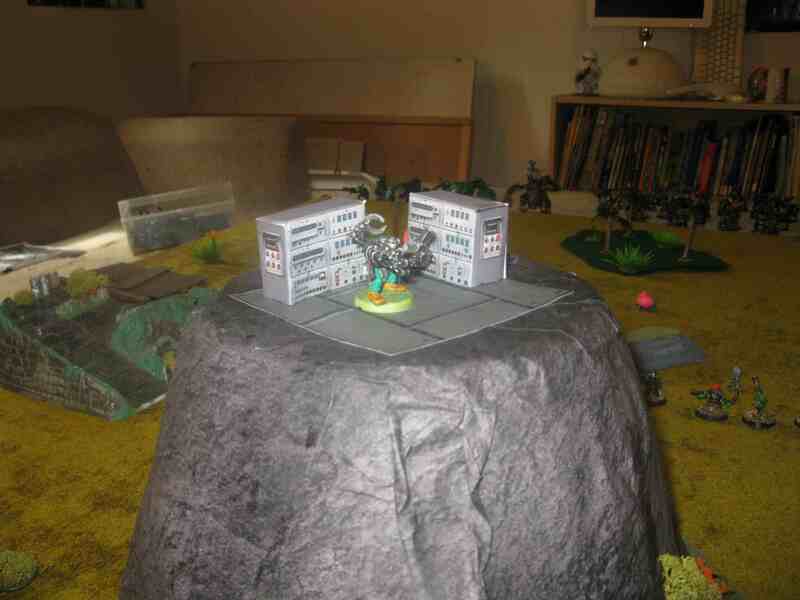 The attacking Deff Dread would eventually be immobilized by an automated Zzzap Gun hidden in the boulders. 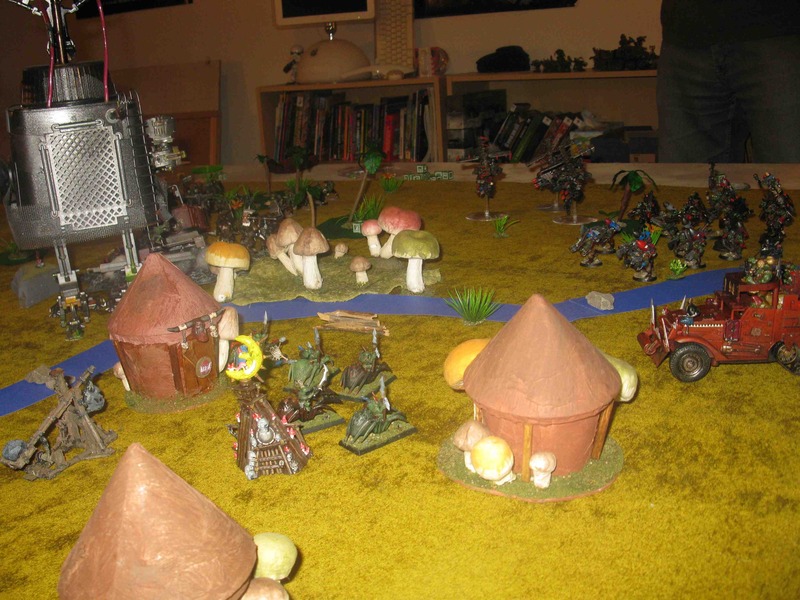 On the Grots’ right flank, Feral Grots faced off against Warboss Vince and the MegaNobz. While lasting somewhat longer than expected (thanks to the Grot’s poisoned weapons), the outcome was never in doubt. Stormboyz headed towards the village. They would soon overrun it, and the Idol would be lost! 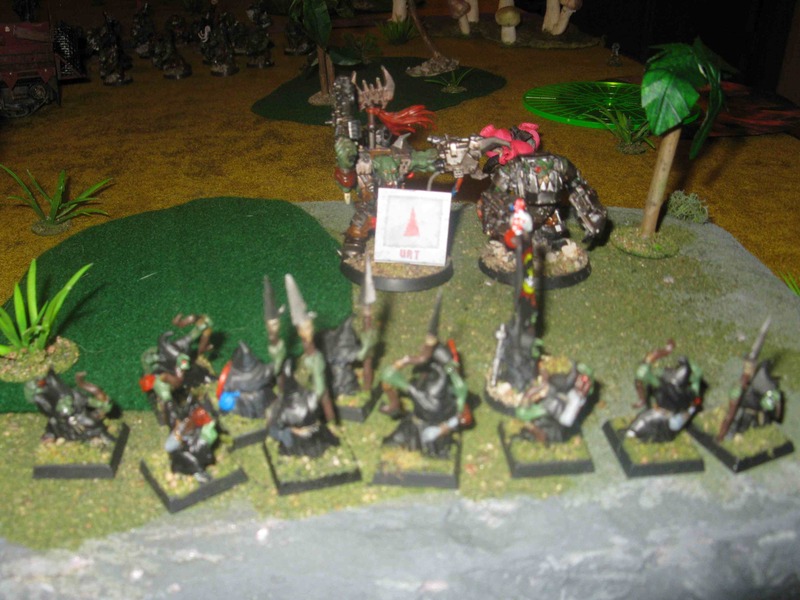 On the Grots’ left flank a unit of Kommandoz arrived and immediately ran into the tunnel leading to Doctor Morork’s secret (or apparently not-so-secret laboratory). 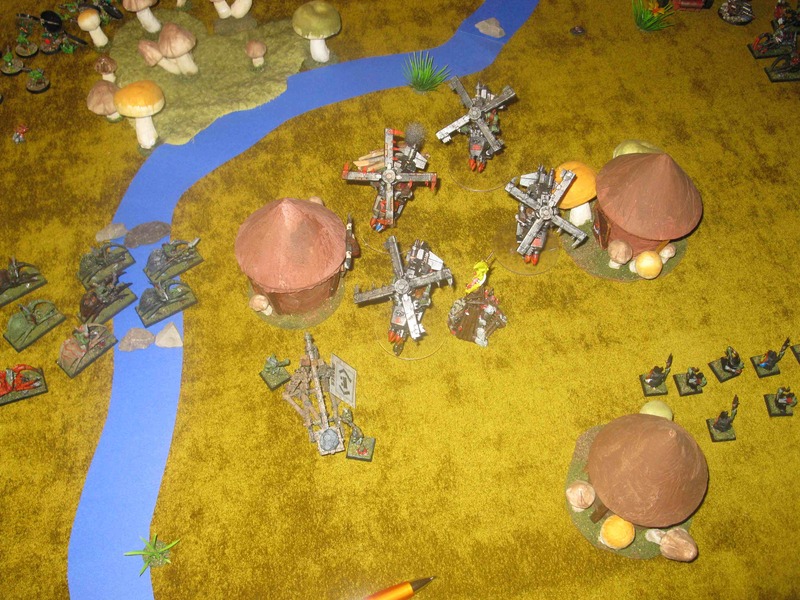 They were stopped just short of their objective and routed, however, by a small band of loyal Nob bodyguards. 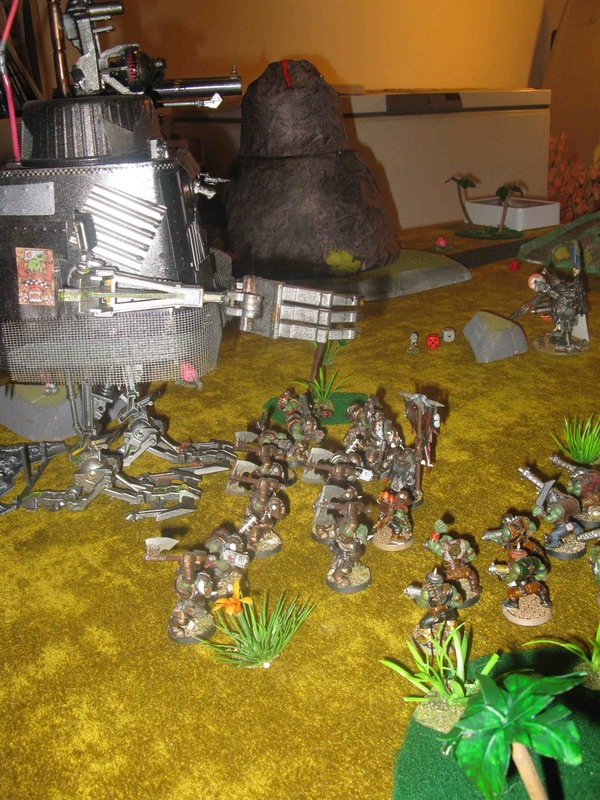 Thereafter, a mob of Shoota Boyz killed off their Grot opponents and also headed towards the volcanic lair. 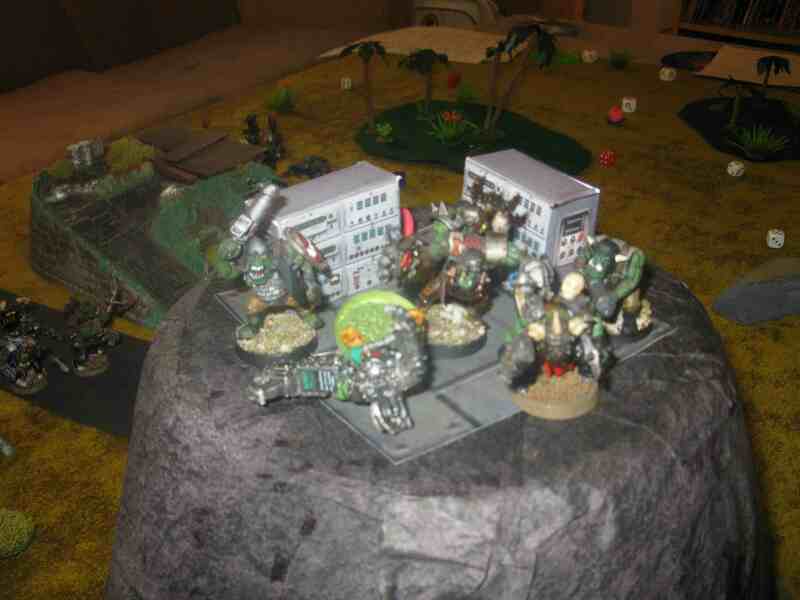 The Stormboyz decided to join the melee against the Stompa. More guacamole! All the Stomping was to no avail, however. The Boyz broke through the Nobz in the tunnel, and forced their way into the control room. After several rounds of bitter claw-to-Klaw fighting, they finally vanquished Doctor Morork! The rebellion was crushed—for now.